Another week, another Epic exclusive—and this one, people are really mad about. That news, plus free copies of The Witness, 20 minutes of Outer Worlds footage, Rage 2 announces a wandering wizard who sells cheat codes, and Prince Harry says Fortnite should be banned. This is gaming news for April 1 to 5. 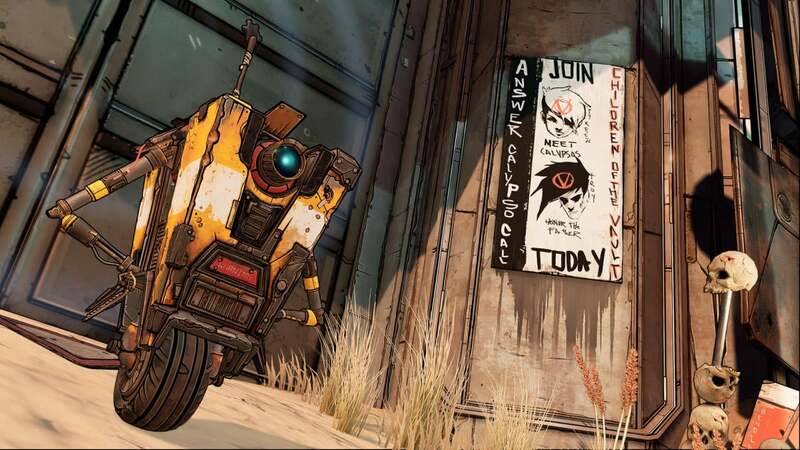 Speaking of which, another big coup emerged this week: Borderlands 3 will forego Steam for the first six months and be an Epic Games Store exclusive. Releasing September 13, that means it won’t hit Steam until April 2020. And the implication, between this and 2K’s subsidiary Private Division, is that other 2K/Take Two games will follow, which opens the door to an eventual Red Dead Redemption 2 PC release being Epic exclusive as well. And hey, maybe that next Ken Levine project, if it ever releases. I’m a little sad Red Thread’s next game isn’t a continuation of the Longest Journey/Dreamfall story but I’m otherwise pretty damn excited for Draugen, which looks to apply the same writing talents to a horror-flavored Norwegian mystery. There’s not much to go on from this two-minute teaser but...it’s a detective story. Maybe that’s the point? Look for the full release in May. I’m still making my way through Yakuza Kiwami and loving it, but sequel Yakuza Kiwami 2 doesn’t seem that far off. This week PC Gamer spotted an ESRB rating for the Kiwami 2 PC port. There’s no release date attached, but generally ratings aren’t done until the game’s close to release. Catherine’s PC port, for instance, was spotted on the ESRB site January 2 and released about a week later. That doesn’t necessarily mean Kiwami 2 will hit next week, but it’s probably imminent. Given that Obsidian’s Outer Worlds is rumored to release in August, we’ve seen remarkably little of it. Or at least, that was true until last weekend when Obsidian showed off a lengthy 20-minute demo during PAX East. You can catch the developer-narrated footage below, with looks at companions, a fancy art deco city, lots of shooting, and a little bit of dialogue. I’m very into it. There’s more Private Division news this week, as we got a new look at Patrice Désilets’s Ancestors: The Humankind Odyssey. Then again, I still have zero idea what the hell this game is except that you’re a chimpanzee and the game has no map. Uh...I hope it’s good. It definitely looks ambitious, if nothing else, but I suspect I won’t know much more until we get our hands on the full release sometime later this year. I don’t know why Rage 2 is getting commentary from NBA Jam announcer Tim Kitzrow. There’s no obvious tie-in here or anything. But Bethesda put out the below trailer for April Fools’ Day this week, then confirmed it’s not a joke. If you want to play Rage 2 with something yelling “Boomshakalaka” and “He’s on fire,” you can do that. That’s not even the best news though. Rage 2 will also feature a wandering wizard who will sell players cheat codes, which sounds brilliant. Elder Scrolls fans, set your expectations appropriately. Bethesda confirmed this week via Todd Howard that neither Elder Scrolls VI nor Starfield will appear at their E3 press conference this year. That’s their prerogative of course, though I do wonder why they bothered teasing the two so early given that Bethesda’s tended to prefer short six-months-and-it’s-released cycles with Fallout 4 and Fallout 76. In any case, don’t be surprised when they don’t show. What will Bethesda fill the time with? I’m curious to find out, because right now Doom Eternal and Wolfenstein: Youngblood are the only other Bethesda games I can think of that won’t already be released by E3. Now that The Division 2 is out, it’s time to embark on the expected multi-year journey of updates. That road starts today with “Tidal Basin,” a new stronghold, as well as a boosted gear score cap and a new difficulty level. It’s all leading up to April 25, with the debut of Operation Dark Hours and the first eight-player raid. Good stuff. The Sonic kart racing games are about the closest equivalent the PC has to Mario Kart, and this new Team Sonic Racing trailer is looking gooooood. I’ll miss the random Sega characters from Sonic & All-Star Racing Transformed, but the track designs look a lot more memorable and colorful this time around. Takes a rather dark turn there at the end, eh? Methinks the Prince doth protest too much.